A post-apocalyptic gangster thriller one step up from Mad Max Beyond Thunderdome. 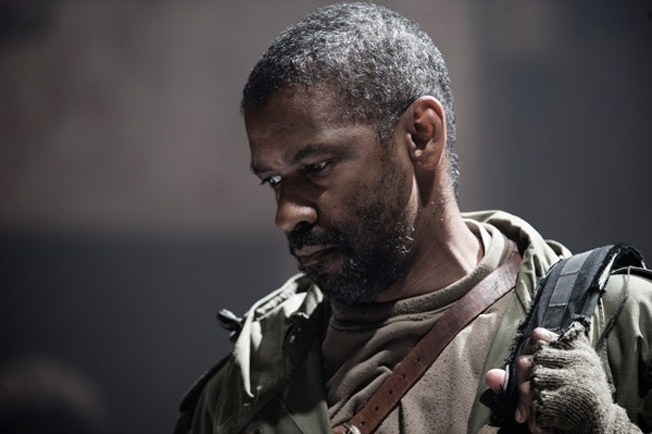 Made for fans of Denzel playing powerful roles, post-apocalyptic travelogues and Spike Lee's films. The face of the earth was completely obliterated by nuclear was over 30 years ago. Denzel Washington plays Eli (but for some reason we don’t find that out until the end of the movie, despite his name being revealed in the movie’s title), a “traveler” following promptings of God to head out West through the ruined, desert wastelands of the United States, protecting the last copy of the bible in existence. Eli’s comes across a roadblock when he enters a gang-run shanty town while seeking clean water and supplies. Carnegie (Gary Oldman, The Dark Knight), the gang’s leader, has grand dreams of reestablishing civilization. Being one of the last “old ones,” Carnegie has nostalgic memories of world prior to the war. Remembering how much power it had over people and nations back then, he constantly has thugs on the hunt for a copy of the bible, knowing that it will help him be powerful in the eyes of his people. When he finds out that a “traveler” passing through his town has a copy of it, Carnegie is willing to do whatever it takes to get that book. When Solara (Mila Kunis, That ’70s Show), a beautiful young woman, befriends Eli and helps him escape town, she is forced to run from Carnegie and and join Eli as he carries out his unknown divine mission of heading West. Together Eli and Solara go on a journey not all that different from the one Viggo Mortensen goes on in The Road – there are crumbling cities, shopping carts and cannibals – only Eli and Solara know who is following them. The Book Of Eli begins very strong, establishing and submerging you in this gritty new world similar to, but not as bleak and hopeless, as that in The Road. You quickly get involved with and wrapped up in the world. But after leaving Carnegie’s town, it gradually falls apart like a Spike Lee “joint,” getting too wrapped-up in its own unnecessarily self-indulgent story. At the end of the movie, there are about four too many twists and three endings. Had the story to The Book Of Eli been an elaborate and complicated one, then the given ending(s) would have been fitting. But it’s not. It’s shallow and simple; therefore, the twists at the end don’t work. If you think that The Book Of Eli looks like a great film, then see it. It’s good, not great. You already know that it’s going to fall apart in the end, but that doesn’t make the rest of it worthless. You’ll have fun with the first three-quarters of it. But if you’ve thought all along that it doesn’t look too great, then don’t see it – it’s not great. But if you end up bored one night months from now and The Book Of Eli is playing at the dollar theater or you see it in a Redbox, check it out. It’s not that bad.